Jagruti's Cooking Odyssey: Khichu - Steamed and Spicy Rice flour dumplings ! "Khichu" has been a part of my childhood memories for so long..those scorching summer holidays, khichu and few stories were part of my growing years ! The Khichu and Khichi papad were mainly made during summer days. We used to wait eagerly for mum to tell us that she is going to make Khichi papad today ! To prepare papad is pretty hard work as it can scold your hands while handling the dough. In a nutshell making papad can be a very sweaty experience, but as kids why did we get so excited to get involved in the whole process of making it ? For me it was the cooked dough's aroma that made it irresistible ! You may wonder what KHICHU is ? 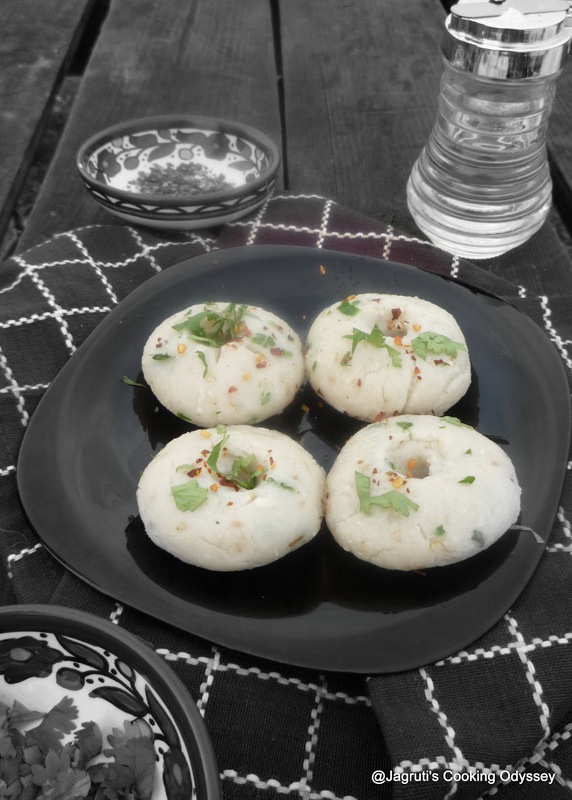 Khichu is the cooked rice flour dough , which is used in preparing rice flour poppadoms. Khich has wonderful taste if eaten with peanut oil, it's a Gujarati household dish which has been carried on from generations and now it's preference in weddings. And also people form queues at food stalls in many cities of Gujarat, surprisingly in UK there is also a regular demand at Indian restaurants. Thus a simplest Gujarati dish has taken Gujarati palate by storm. Britain weather doesn't permit me to make papads as we require an Indian Summer, but really that is an excuse for me as I can't bare the labour for making these ;-) I'm a fan of khichu and it always reminds me of my childhood every time I prepare !! Heat 2 cup water in a heavy bottom pan. Add cumin seeds, chillies, sesame seeds, salt and soda. When water starts boiling, add rice flour to it. Don't touch the flour, just let it cook on a low heat. 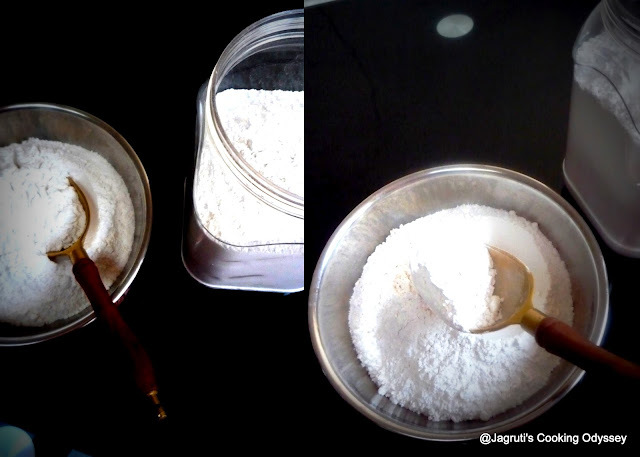 After few minutes when water absorbed by flour, with wooden spoon stir the mixture. Turn off the heat. Let it cool for 5 minutes. Take a small amount of flour mixture, make a small ball and slightly flatten the ball. Steam the flatten rice ball for 15 minutes. Serve with peanut oil, chilli flakes and green chutney. Note :- You can skip the steam method and continue , let the mixture cook on a very low heat about 15-20 minutes. Then straight away serve. Linking this dish to Know your flours - Rice flour guest host by Nithu Bala event by JCO. tht looks soo yummmm ...lovely clicks ! Unique and healthy dish,love the clicks. Sounds very interesting and new for me. We make similar dish called ukad. my mom makes it when it rains. Where in ukcan I buy this? Where in UK can I buy khichu? Any particular shop or restaurant?